Sailing south from New York on a Caribbean cruise, Norwegian Breakaway suddenly changed course heading for the coast of Virginia. Captain Hakan Svedung came on the public address system and announced that a passenger had become ill and that the patient needed shoreside medical care. Therefore, Breakaway was going to rendezvous with a U.S. Coast Guard helicopter for a medical evacuation. The reason that Breakaway had to change course in order to do the evacuation was to bring the ship within helicopter range. Even with advances in aviation technology, a helicopter's range only extends about 200 miles from shore. Thus, if the ship is beyond helicopter range, the ship must change course and sail to a point where it is possible to rendezvous. In this case, Breakaway had to divert from her planned course for five hours. “They fly out as much as they can and we come in to meet them.” Captain Svedung explained. Meanwhile, announcements were being made on Breakaway informing the passengers as to what was happening. “It is always important that we keep the guests informed. It is a question of keeping everybody abreast and informed. The [guests] are more comfortable with the process than leaving things open to interpretation . Obviously, we are not going to disclose the medical intricacies and so forth but at least you know what is happening,” said Mr. Kainikkara. Included in the announcements were warnings to stay off the open decks and not to take flash photographs of the aircraft. An evacuation is an intricate maneuver and a distraction such as a flash from a camera could result in a crash. Moreover, if a crash did take place, people standing on the open decks might be injured by fire or flying debris. 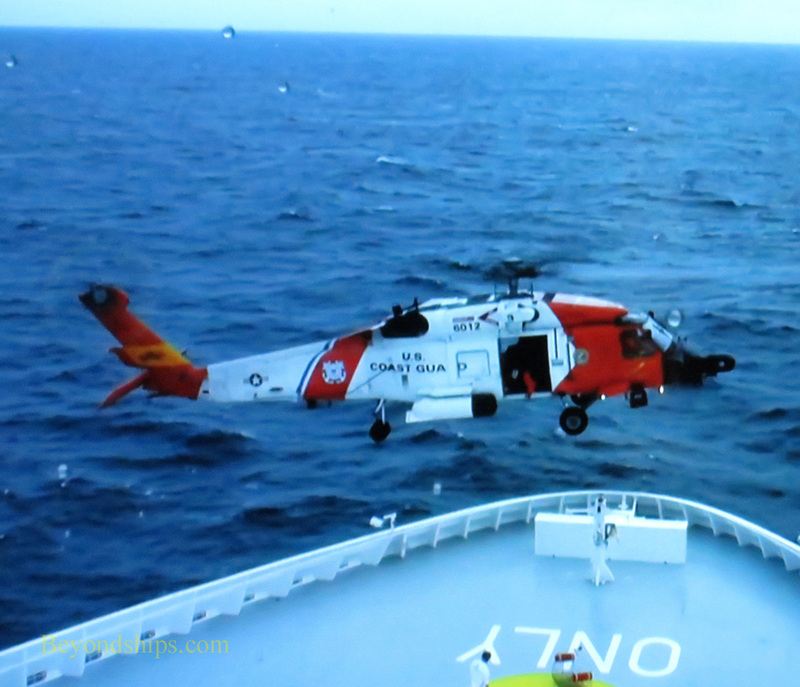 Even though there is what looks like a helipad marked out on Breakaway's bow, the helicopter did not land on Breakaway. On closer examination, one can see that the markings on the bow do not indicate a landing zone but rather a winching area. Indeed, the markings say “WINCH ONLY” in large letters. This is because military helicopters are too heavy to land on a cruise ship. Accordingly, the helicopter came down low and drew up so that it was keeping pace with the ship. Because of the air currents swirling around the ship, it was deemed safer for the ship to keep moving rather than stop while the evacuation took place. Slowly the helicopter moved so that it was over the helicopter markings on Breakaway's bow. At a height below that of the bridge, it let down a line and lowered a Coast Guardsman down onto Breakaway's deck. This person came aboard in order to work with Breakaway's crew and oversee the transfer of the patient onto the helicopter. The helicopter did not hover overhead waiting for the Guardsman to do his work. It would have been difficult and dangerous to hold position over the moving ship. Therefore, the helicopter moved off to wait in a safer location. When the patient had been bundled and safely secured in the metal basket that would take the patient up to the helicopter, it came back and again maneuvered so that it was over the bow. It let down a line which the people on deck secured to the metal basket. The noise under a helicopter performing such an operation is deafening. Once the basket was attached, the helicopter began winching it up. 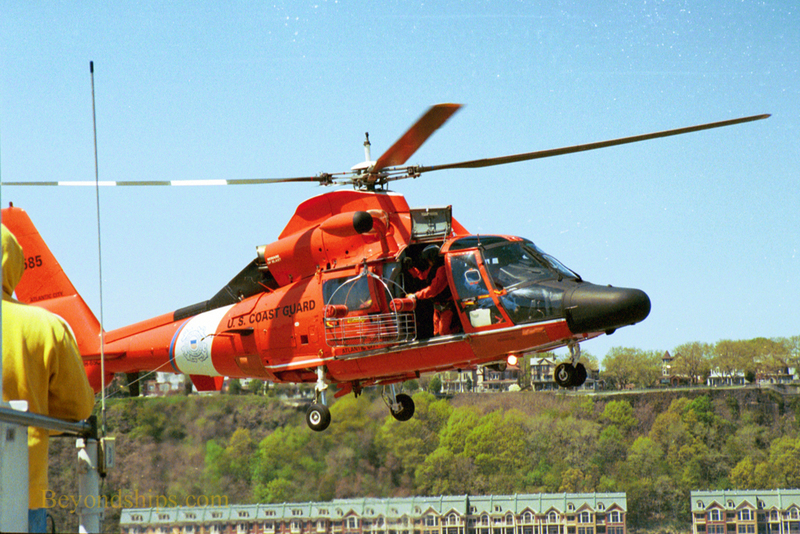 Another Coast Guardsman lying on his stomach in the cabin, struggled to pull the basket through the open door of the helicopter. When it was inside, the helicopter again pulled away from the ship. This entire maneuver was repeated for another basket. Presumably, this basket contained the patient's traveling companion. Even though the companion is usually healthy, transferring them in the same way as a patient is often the safest method. Once the civilians were aboard, the helicopter returned for the Coast Guardsman who had winched down onto Breakaway. When he too was aboard, the helicopter and the airplane departed. Breakaway could now resume her cruise. However, as a result of the medical evacuation, the first port call had to be canceled. “There was no way that we could have reached San Juan after sailing almost five hours in the wrong direction in order to meet the helicopter,” explained the Captain. In addition to the medical staff and the bridge officers, quite a few of Breakaway's crew members were involved in the operation. “We need to have fire groups prepared if something happens with the helicopter. If the helicopter goes down into the water, our rescue team must be prepared as well,” the Captain pointed out. 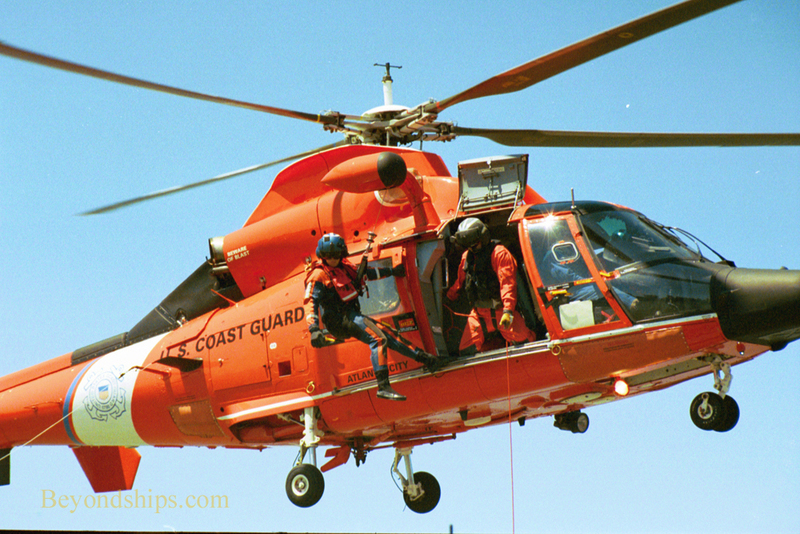 Above: During a training exercise, a Coast Guard helicopter prepares to lower a Coast Guardsman onto the deck of a ship. ​Below: The helicopter prepares to lower a basket onto the deck of the ship. Note that the helicopter is now eye-level with the people standing on the ship's superstructure.